The origins of chicken tikka masala are disputed. 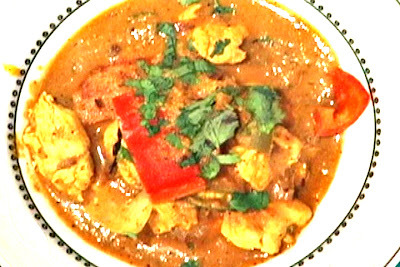 At least one source has the dish originating in New Delhi in 1947, but it also has been suggested that chicken tikka masala originated from the kitchens of Bangladeshi chefs in the UK, with many restaurants throughout the country claiming to have invented it. The recipe's age is also unproven, with claims ranging from the 1970s back to the 1950s. A widely reported explanation of the origins of the dish is that it was conceived in an Indian restaurant in Glasgow in the late 1960s, when a customer, who found the traditional chicken tikka too dry, asked for some "gravy". The chef improvised a sauce from tomato soup, yogurt and spices.